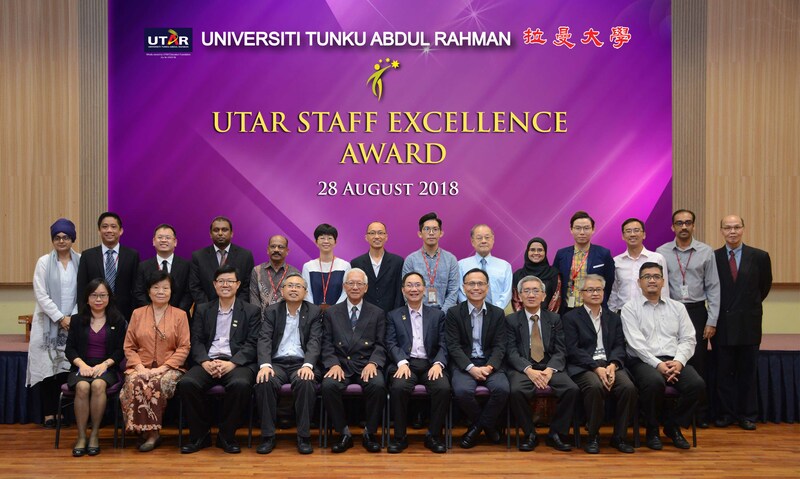 The UTAR Staff Long Service and Excellence Awards 2018 was held at Sungai Long Campus on 28 August 2018. The event aimed to reward and give recognition to staff members who have excellently performed in the areas of teaching, e-learning, innovation, research and service. The award served as an incentive to encourage staff members to continue the efforts to achieve excellence. “Despite being a 16-year-old university, our concerted efforts in teaching, research and development have resulted in UTAR to be ranked 501 – 600 in the Times Higher Education World University Rankings 2018 Top 1,000 list and ranked 99 in the Times Higher Education Asia University Rankings 2018, which is Top 2 in Malaysia,” Prof Chuah said. Prof Chuah also expressed his appreciation to the University’s Board of Trustees, Council, Deans, academic and administrative staff. He especially thanked the vice presidents for their help and support in bringing up the University. Present at the event was Chairman of Board of Trustees Tan Sri Dato’ Dr Sak Cheng Lum, Education Foundation Secretary Ong Whee Tiong, UTAR President Ir Prof Academician Dato’ Dr Chuah Hean Teik, UTAR Vice Presidents Prof Ir Dr Ewe Hong Tat, Prof Lee and Prof Dr Choong Chee Keong, Registrar Yim Lin Heng, Director of Institute of Postgraduate Studies and Research Prof Ts Dr Faidz bin Abd Rahman, Director of Division of Human Resource Marchie Lim Pin Sim, Sungai Long Campus Administration Director Dr Tan Kee Kong, award recipients and staff. 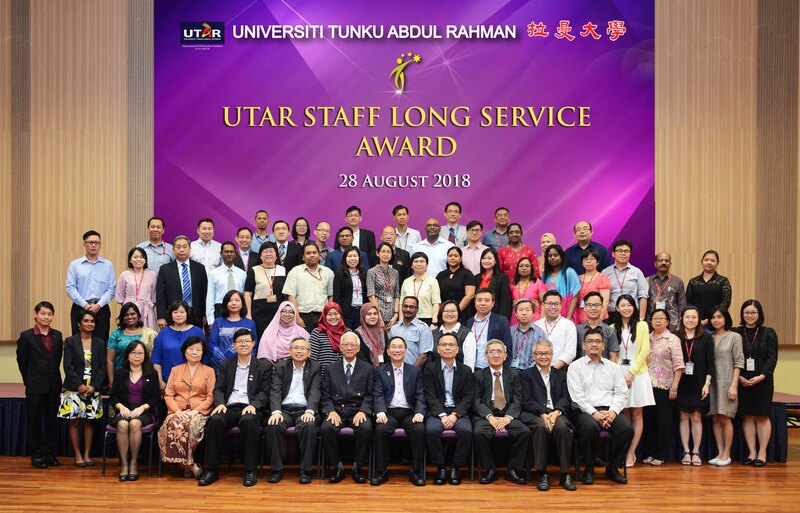 Centre for Foundation Studies of Sungai Long Campus Deputy Director Wong Jing Tyng, the recipient of Long Service Award, stated that the reason she remained in UTAR is because of the friendly environment and the helpful colleagues. It was also largely due to her passion for teaching. 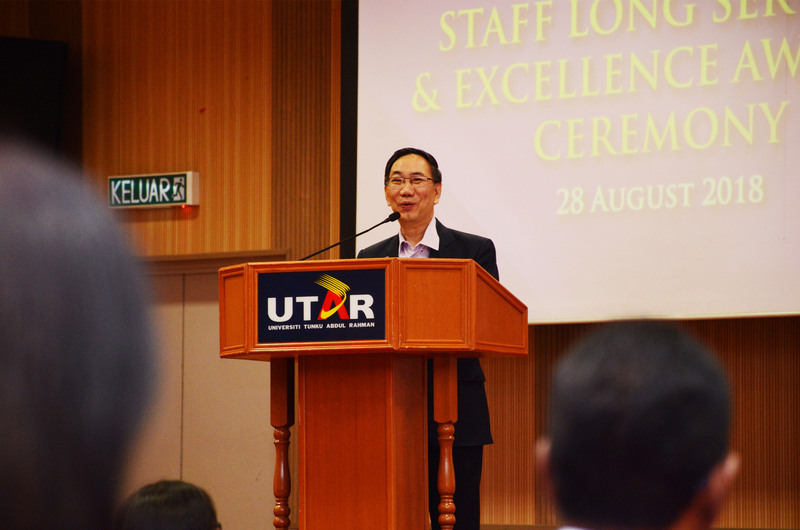 “UTAR has provided me with the opportunity to further my studies and has given me the chance to explore various teaching techniques,” said Wong. As the recipient of Teaching Excellence Award, Faculty of Accountancy and Management Deputy Dean David Ng advised educators to give more life examples to the students so that they can relate and understand and be able to apply the theories in real life. Educators should also urge students to ask questions in the classroom and stimulate their interest in the subjects. David Ng mentioned that one of the biggest challenges was to keep track of all the latest updates in the accounting field. Hence, he has to constantly study and read the newspaper to learn its latest trends. Faculty of Arts and Social Science Lecturer Inderjit, the recipient of e-Learning Excellence Award, explained that an e-learning system helps to stimulate students’ interest and engage their attention in the classroom as it is something new to the students. It also helps the lecturers to keep track of the students’ answers in real time. She advised lecturers to be more creative in terms of utilising the teaching tools and materials, and not to be afraid of incorporating technology into their teaching.